Philadelphia Braces For A Downturn In Graduation Rates : NPR Ed Opponents say exit exams put barriers in the way of students; proponents say more rigor is needed. Xiuying Zhang, a senior at Furness High School, could not pass any portion of the Keystone Exams. 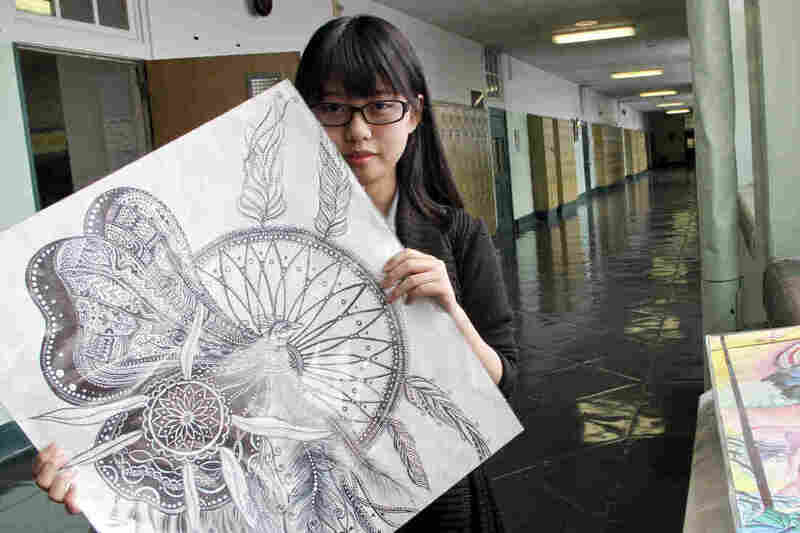 She has been accepted to University of the Arts and hopes to become an artist. The US high school graduation rate is at an all-time high. But why? NPR Ed partnered with 14 member stations around the country to bring you the stories behind that number. Check out the whole story here. And find out what's happening in your state. Pennsylvania's high school graduation rate is 86 percent, but that may change in the next couple of years. Why? Starting with the class of 2017, students will have to pass tests in Literature, Algebra and Biology — subject areas many high schoolers find difficult. Students have been taking the tests, called the Keystone Exams, for several years now. But the new graduation requirement has caused a lot of concern, especially the Biology exam. Last year just 54 percent of test-takers across the state passed. The state's many struggling districts – which have seen drastic cuts to school personnel in recent years – are scrambling to figure out how they'll provide the support that students will need. Philadelphia, especially, is bracing for a drop in the graduation rate once the testing requirement takes effect. Right now, the graduation rate in the city is 65 percent. But based on the current scores on these tests, four out of five students in Philadelphia would need to take an alternative route in order to graduate. This means submitting project-based assessments. Xiuying Zhang is a senior at South Philadelphia's Furness High School – located in an ethnically diverse neighborhood where about half of the students are still learning English. Zhang, who moved to Philly from Hong Kong three years ago, has struggled with each of the tests. "I almost passed," she said of the Literature and Algebra tests, "but I didn't make it." As for Biology? "No. I sleep during the class," she said. "I don't know how to do it. I'm not good at Biology." Zhang does not consider herself an academic slouch. She immerses herself in her rigorous AP Art class. "I didn't go out for a year for fun," she said, "because I stay home and draw." Critics of the new requirements say they'll needlessly hamstring students whose intellectual prowess can't be captured by tests. Others say it will push schools to devote even more time to "teaching-to-the-test." Supporters of the requirement, though, say the state needs to do a better job ensuring that all students are prepared for the modern job market. Giving credence to this point, 70 percent of students at the Community College of Philadelphia need remedial work before moving on to college-level classes. Zhang, a gifted illustrator, decided to attend Philadelphia's University of the Arts in the fall, after getting accepted to several other art colleges. If the new rules were already in place, she has no idea what she'd do. "I think that it's crazy," she said, "because you don't have to pass the Keystone for college or anything else." Click here for more from Kevin McCorry.